--From the SNES Final Fantasy 2 instruction manual. 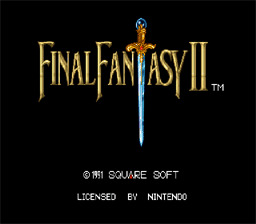 Play Final Fantasy 2 Now! Traditional turn-based RPG on a quest to save the world! First, find the Avenger sword in the game, you'll need it for the trick. Equip Cecil with arrows in his right hand, and any kind of bow in his left. Get into a battle and make sure that nobody does anything. If a character's turn comes before his, have them parry (press right and the parry option will come up). Once it gets to Cecil's turn, enter the item screen. Grab the arrows he has equipped and bring them down to an empty slot. Without leaving the window, select the Avenger sword and move it up to his BAD hand. From there, press B to exit the items window and his commands will disappear because the Avenger sword causes the person with it equipped to be berserked. Don't have any other characters do ANYTHING! Just let Cecil beat up all the enemies. After the battle, go to the Equip screen for Cecil. Move the Avenger sword to an empty slot, and then without leaving the screen move the sword you would like to duplicate 250 times into his right hand. De-equip, and re-equip, and you should have a sword with a circle and number next to it in your inventory. This trick must be followed TO THE LETTER.